The sun might be shining here in Edinburgh finally for Easter weekend, but in the world of luxury travel the sun always shines, thanks to some of the amazing blogs that we love to read each month. Our mission is to curate the best content in the luxury travel sector and that includes highlighting luxury blog content too. If you are new to blogging, the following are essential viewing, so make sure you put them on you reading list. Mrs O probably needs no introduction, but just in case, here goes. 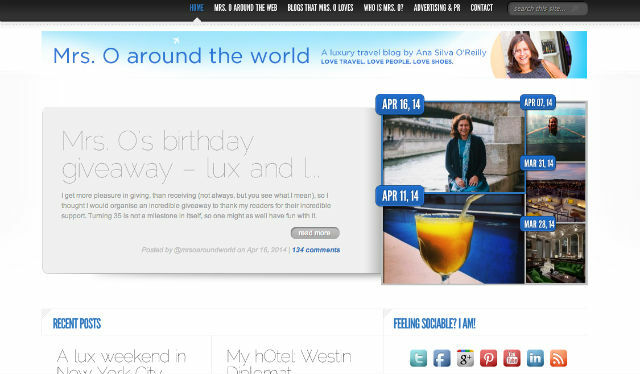 Mrs O, aka Ana Silva O’Riley is certainly the queen of luxury blogging in the UK! Ana’s blog is all about her experiences traveling and exploring the finer establishments the world has to offer. 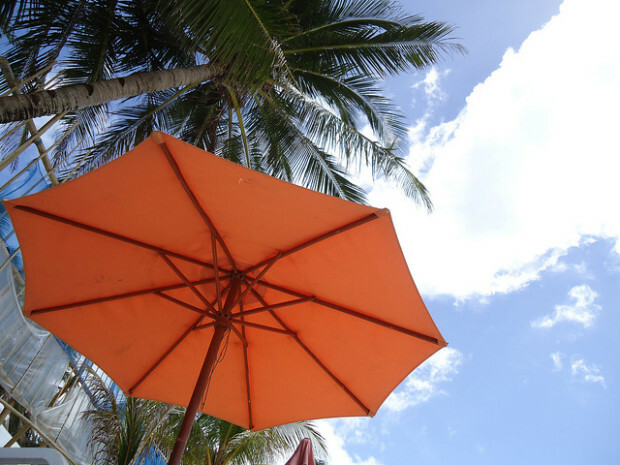 And Ana certainly has stayed at some of the worlds best establishments so her blog is a great read for getting the lowdown on where to stay when. April is Ana’s birthday and she has a stackful of goodies on her blog that she is giving away, so now is a great time to start reading! 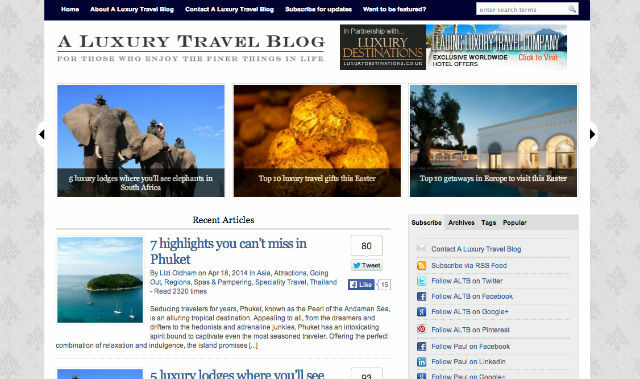 Not so much a blog as more of an institution in the luxury travel sector. Run by Dr Paul Johnson this website is a travel blog publishing machine. If a luxury topic hasn’t been written about on Paul’s website then it probably doesn’t exist. The content on the website is a mix of interviews, guides, luxury innovation and technology reports. So ideal for anyone wanting to keep their finger on the pulse in this sector. 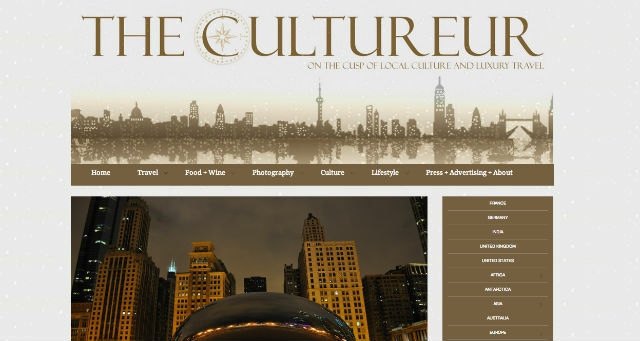 We also like reading The Culturer, run by Nyssa, her blog is a mix of hotel reviews, destination content as well as food culture and lifestyle content. 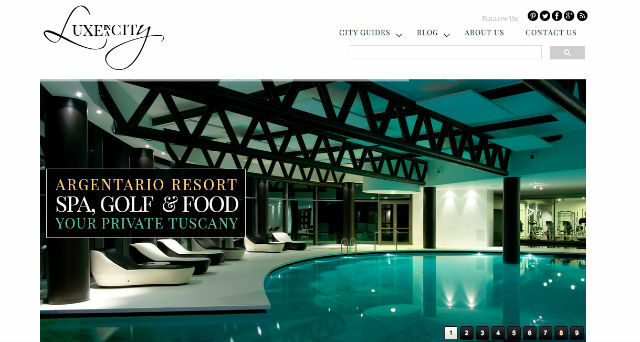 A great website if you are looking for that next luxury establishment to stay at. Useful reviews and beautiful imagery; run by a pair of expert luxury travellers seeking out only the most stylish hotels and resorts across the globe with the ‘wow’ factor. Another veteran of the luxury travel sector, Velvet Escape aka Keith Jenkins former banker turned travel entrepeur and expert luxury travel writer! We have followed Keith’s website for a number of years now, and it was thanks to the website, that we ended up visiting Penang in Malaysia last year on ourt travels. 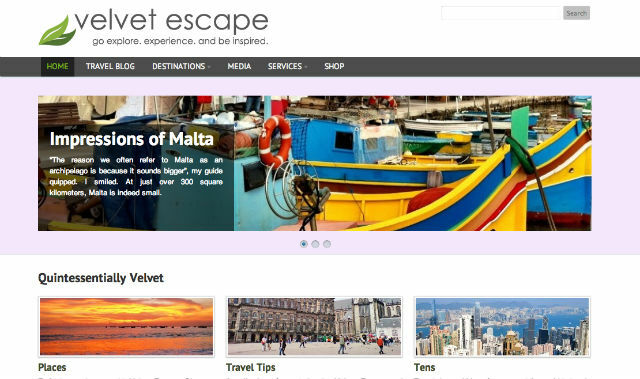 Velvet Escape is a mix of travel destination content and inspirational guides. if you are planning on traveling then see where Keith has been and follow his advice. Who else have we been speaking to this month? 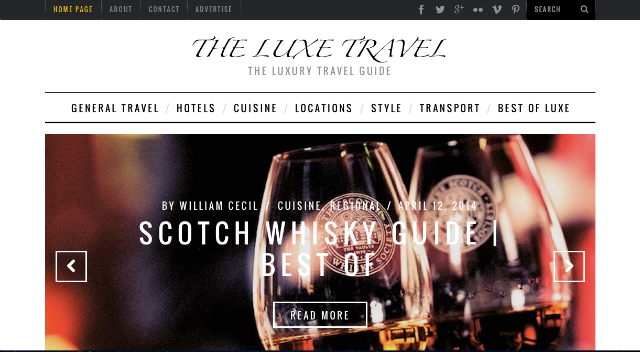 We wrote a piece for LuxeInACity, a luxury travel guide run by Maxine and Roxanne Genier. It’s a great portal for uncovering whats happening and where to stay in key cities around the world. We have also been catching up with Will who run’s the Lux Travel. A London based website with great content about what is happening around the world in the luxury market.